Yesterday we had our long awaited cross country lesson with Petros and I am pleased to say it went incredibly well! We broke the spell of falling off every time we go cross country schooling and we both felt incredibly confident afterwards. So it was a huge success really. Our lesson was at Milton Keynes Equestrian Centre and after I was on we headed to the mini course to start our lesson. This was for my confidence as much as Scottie’s, I wanted to tackle things I knew we could just step over. On the way to the mini course area we talked about Scottie, where we were and what I was hoping for the session. Once we were at the mini course we started to warm up in between the jumps so Scottie could have a look at them all. We focused on getting him forwards and listening to me. When it came to cantering, he wanted me to stand up and really push my hands forwards to encourage him forwards. Scottie was quite tense so was doing his usual party trick of doing virtually everything on the spot. But after a few more canters he started to relax and move forwards. After we were warmed up we went and had a look at one of the sections of telegraph pole making a small log style jump. The idea of giving him a look at it was so the he had no excuse to stop on the approach. Before we turned to approach it I was told to jog into it and think of the jump as a placing pole to ask for canter. On the first attempt I think we did come to a slow stop, but I think that was more rider error than anything else and the next time round we popped over it without a fuss. After popping it a few more times we moved onto two more telegraph pole jumps. We didn’t stop at either of these and then built them into a little course of 3 jumps. 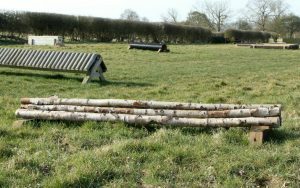 Scottie got a bit keen into these and pulled me into each jump and it then took me the length of the small field to pull him back up! Next we jumped this little course the other way round, which for Scottie can be the perfect excuse to back off and refuse, but he popped over them all without question. After a little breather, we moved onto a few more cross country style fences, starting with a log pile style jump. On the first approach my line was fairly awful and we came to a stop as he tried to run out. He had a good look at the jump and we tried again, this time on a better line. Once again, we came to a stop where I wasn’t riding as forwards as I could have been. But on the 3rd time we popped over it. And after that there was no doubts from Scottie about it. Next we had a go at going up and down a little bank they have there. We walked up to it and followed Petros up onto it and back down again with no drama and only the smallest hesitation from Scottie. Very soon we were trotting up and down it in different directions very happily. I think Scottie was pleased to be doing something he was confident doing and since it was steps I had my fall after, it was a bit of a relief. Our next jump was a black pipe, which did take a good few attempts to get Scottie over it. But Petros said that most horses look at black pipe. After we were over this a few times we moved onto a wooden chair style fence. We did stop first time at this, but as we came to a stop Scottie pretty much stood on the fence. So if I had ridden a little more positively, we would have gotten over it first time. On our second attempt he popped it with no questions. We jumped these two a couple more times before having a go at a brush fence which to my surprise Scottie popped over straight away! 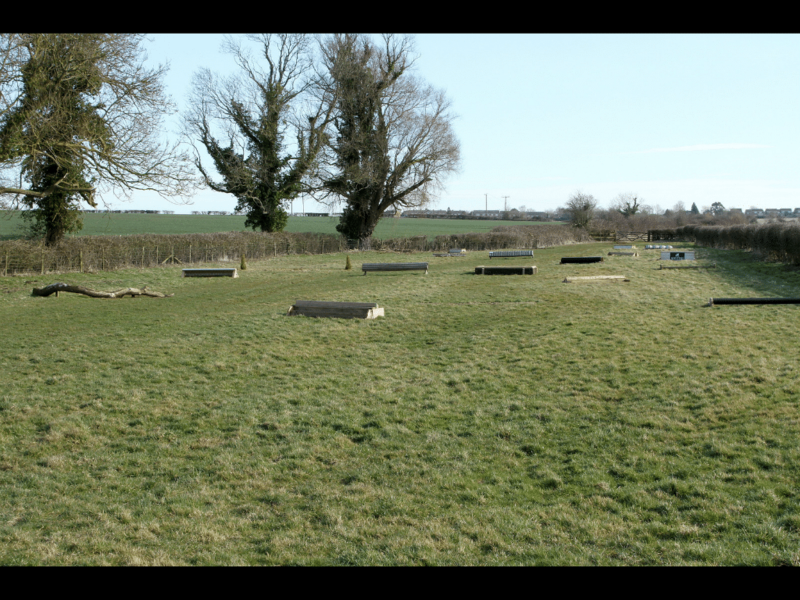 We then turned these jumps and the bank into a mini course which we popped around lovely! Scottie also felt incredibly pleased with himself. We left the mini course and headed to the water to finish with. We kept it nice and simple, starting with walking into and through the water. Scottie usually quite enjoys the water, although he was a little bit hesitant, he didn’t take much convincing. We then started working walking in and trotting out, then building up to trotting in and cantering out from both directions. This was a fantastic end to our session! Petros has some really interesting comments about Scottie and how to ride him better. He said that he is incredibly sensitive which means I have to be super careful not to pull his mouth as this could be enough for him to say no to a jump. He also said to ride him like a racehorse. By this he means stand up to free up his back and push my hands forward to encourage him to stretch and move forwards. Over all it was a really fantastic lesson and I feel so much better about our jumping after this lesson. A fantastic step in the right direction! *These photos are from the Milton Keynes Equestrian Centre website to demonstrate the course. For more examples of their course please visit their website.